It’s difficult to ask the big questions. What if I’d done it all differently? Did we do everything we could have? Could I have met someone else? Largely because there is no good or discernible answer. In Visitors, Barney Norris sets out to interrogate where we are going and where we have come from, but in abandoning existential angst and tormented love affairs (the usual terrain of such narratives) to explore what it means simply to have grown old together in a relatively unimpeded manner, he cuts much closer to the bone in a wonderfully rolling Waiting for Godot meets Last Tango In Halifax, taking stock of endings, beginnings, and the strange, often odd and aimless-feeling bits in the middle. 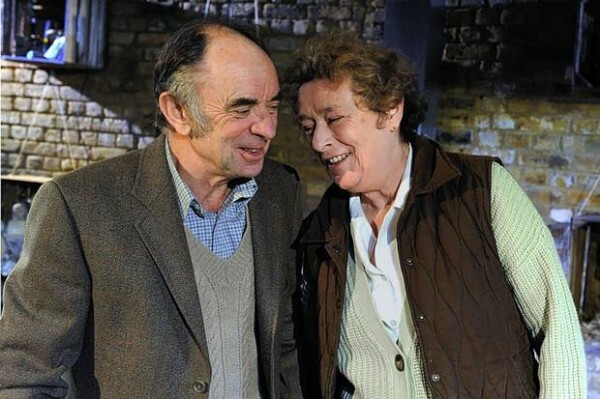 Edie (Linda Basset) and Arthur (Robin Soans) have lived in the same house, run the same farm, for their entire married lives. Now as Edie’s mind and the last threads of their way of life are slipping away, they are gently questioning each other, cracking terrible jokes and trying to understand how they arrived here, just exactly what here means and what on earth WWOOFing entails. It is actually frustrating that seeing such a comfortable and beautifully realised relationship on stage, especially that of an older couple, should be such a rare treat, but it is. Edie is the type of older woman rarely encountered on stage and so desperately needed; not some sense of faded days of glory but an imperfect, whole and fiercely present person with a wicked and wonderfully self deprecating sense of humour. It is almost impossible to take your eyes off Basset; so much is conveyed with worried, fleeting glances and a wry twinkle of the eye. Edie comes to terms with her worsening dementia and its effects on her family in her own inimitable and heartbreaking style; at one turn holding forth in arguments (“Just forget it.” “I probably will.”), at yet another suggesting that her armchair be lined with plastic bags as she is becoming increasingly incontinent. Norris has woven a rich array of characters and there is no sense that anyone from their harangued intermittently present son Stephen (Simon Muller) to newly arrived home help Kate (Eleanor Wyld) is here to prop up a narrative soapbox on aging and mental illness – this is simply a group of people trying to find their place in the world, bumping into and skirting around each other along the way. There are even knottier questions; is it easier to have your life set out for you than to have too much choice? Kate is struggling to find her own direction, while Stephen seems profoundly unhappy with his, possibly due to being consistently undermined by his parents, while Arthur puzzles over Edie’s sudden penchant for cooking Ottolenghi. The production handles time in an interesting fashion, and although some scenes can seem to lag, it feels more as though we are in chime with the pace of their way of life; long hours spent sitting in the chair because moving around the house is simply too difficult. Though occasionally veering towards proselytising, the script for the most part steers deftly through the difficult choices facing those caring for relatives with dementia. Edie and Arthur laugh at their own frailty, comfortable in their belief in an afterlife presumably spent together, but there are sudden, sharp moments of fear at the realisation that separation may be a fate worse than death. As Edie’s illness worsens, there is a sense that it has always been about the two of them; all others, even Stephen, were merely visitors. Sharply funny, tender and at moments utterly eviscerating, Visitors is the measure of a life lived across three generations; asking where we come from, where we are going, and what might be there when we arrive.